So you want to publish some Unity games to the wacky open game console known as Ouya (Ooo-ya! Kind of like the Kool-Aid Man from those old commercials). Obviously you'll need Unity installed and obtain an Ouya console. So go do those things if you need to. Note that this is geared toward those running Unity under Windows 7, though there will be some crossover if you're on Mac. * A PC or Mac to develop on. Duh. * An Ouya console. It should be near your PC or Mac during development. Be aware that some cameras come with USB cables that sort of look like micro-USB cables, but many of them have proprietary connectors that simply won't work. That's the same address you see if you go into the MAKE menu on your Ouya. Click one of the links and you'll be asked if you want to make your account into a developer account. The correct answer is "Yes." To complete your developer account setup, fill in the required sections and agree to the terms. You can input a bank routing number and account number so that Ouya can pay you, if you have any players that purchase your content. You can also print out and sign a W-9 form for tax purposes if you live in the U.S., then submit the scanned-in form as a PDF. When you complete the process, you'll get a unique identifier that's a long sequence of numbers and letters called a Developer UUID. UUID means Universally Unique Identifier. The download from GitHub was very slow for me, so you may need to be patient. The Ouya documentation says to use a 32-bit version of JDK 1.6. From what I can gather, if you're running a recent Unity 4.x version, you can go ahead and install JDK 1.7. This part is very confusing, since 1.6 is described as "Development Kit 6u43" and 1.7 is described as "Development Kit 7" (or more specifically at the time of this writing, Development Kit 7u25). Huh? I chose the "Windows x86" version on the JDK 7 page, which was an 89 MB file. Remember to click the "Accept License Agreement" radio button first. Luckily the Oracle site is smoking fast - no waiting this time! Side note: you'll eventually end up at the above link if you hit the "Download JDK 6 32-bit" button in the Ouya Panel within Unity. We're getting ahead of ourselves here, but when you later see that button, you'll know what that's all about. I chose the Window 32-bit one, even though I'm running Windows 7 64-bit. I believe you want 32-bit for all of this stuff. This was a 414 MB file, but it was a very quick download, I guess since it's right off the Android developer site. I had a 22" LCD TV in my bedroom that I never watch, so I grabbed it, set it up right next to my computer monitor, and hooked my Ouya to it. If you can manage a similar setup, it'll make things a lot easier, since you'll be dealing with a wired connection from your PC to your Ouya. So if you have an extra TV (or monitor that has sound) and an HDMI input and you can put it near your PC or Mac, that'll make things a lot easier. 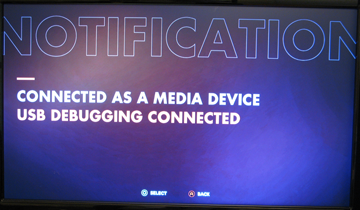 The connection between your Ouya console and PC or Mac running Unity will be a wired USB connection. If you've deployed to Android devices before, you may be familiar with this. I believe Unity uses a utility in the Android SDK called Android Debugging Bridge or "ADB" to deploy projects to Android devices. In order for ADB to "see" an Android device, you'll need to install a driver. The Windows Android SDK includes a Windows USB driver for Android devices. 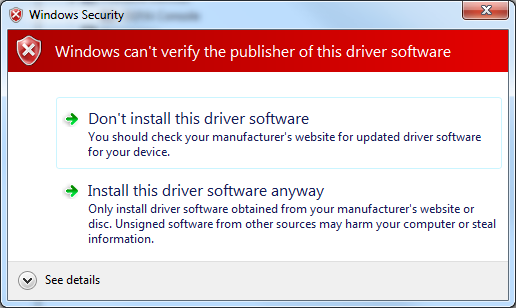 For me, it was in the SDK folder under /extras/google/usb_driver/. One of the files that's part of the driver is called android_winusb.inf. On a side note, this means that the Ouya has a Vendor ID of 2836 (in hex). Windows will see the Ouya's internal storage like it's a phone, tablet, camera, music player, etc. It uses the Media Transfer Protocol (MTP) for that, so you'll see a new "Eject MTP" option in your Safely Remove Hardware list. You can see the APK (Android Package) files of any games you've downloaded in the root of the drive letter that Windows assigns. That's nice and all, but we need Windows to also recognize the Ouya as an ADB device, not just a storage device. Trust me when I say that this is a glorious sight. 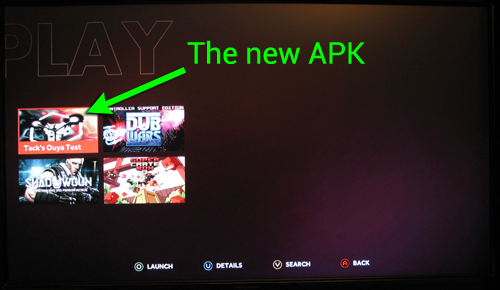 Windows and your Ouya will now be able to talk via ADB! I knew we just needed to get those two together and they'd hit it off. NOTE: In order to be able to run ADB.EXE from any folder in a command prompt, you'll want to add the full path to your PATH environnment variable in Windows. Google it for more info, as that is beyond the scope of this tutorial. If you see some random letters and numbers followed by the word "device" under "List of devices attached", that's really, really good news. Android Debugging Bridge is talking to your Ouya. Congrats! Now Unity will be able to "see" your Ouya, though there's still some stuff to configure for builds to actually work. Selecting those will bring you to options related to USB connectivity and debugging, but you shouldn't have to mess with the settings. Even if you already deploy to Android devices, you may need to set up some more stuff in the Android SDK. If you don't have the Android SDK installed at all, now is the time. In my case, I had already been messing around with deploying to an Android tablet, so I needed to pull up the SDK Manager that was part of my existing Android SDK installation. You'll still need to do this if you have a new Android SDK installation. Under your Android SDK folder you should have a file "SDK Manager.exe." I right-clicked and ran as administrator. I did not have Android 4.1.2 stuff installed, but I did have the Android Support Library installed. So click what you need to (if anything) and hit the "Install X packages..." button. The number of packages you need may vary from what I needed. Hit the "Accept License" radio button, then hit Install. The components will download and install. Took a couple of minutes for me. Kind of cheesy, yeah, but you gotta do what you gotta do. If you don't already have the JDK installed (I didn't), go ahead and install it now. My installer was called jdk-7u25-windows-i586.exe, which is JDK 1.7. Yours may be called something else, and certainly will if you chose to download JDK 1.6. I ran the EXE as administrator just in case that was needed. I took all of the defaults. You can skip the "Next Steps" button at the end of the installation and just hit Close. Go ahead and install the Android NDK if you haven't already. Right off the bat, I found the instructions confusing. The very first YouTube video says to open up a Unity package in a "Packages" folder from the Ouya Development Kit (ODK), rather than the Unity plug-in and samples. I initially downloaded the ODK, but it didn't have such a folder. What you really want to do is unzip the plug-in and samples ZIP file, then open up the contents as a Unity project. So fire up Unity and select File -> Open Project. Then navigate to the top level from the zip (a folder called "ouya-unity-plugin-master"). Apparently the plug-in contains files in Unity 3.x format. Since I'm running 4.x, Unity asked if I wanted to convert, so I said "yes." LitJson is a JSON parsing library. I guess some of the sample scenes use that. NGUI you may be familiar with. It's a popular commercial add-on for building UI's that the sample scenes use. The Ouya folder contains all of the sample assets themselves as well as some Ouya-specific Unity scripts. The Plugins folder contains more of the actual "glue" to integrate with Ouya. An interesting first scene to check out in the project is SceneShowUnityInput under Ouya/Examples/Scenes. It shows what buttons and axes are which for whatever controllers are paired to your Ouya. We're going to deploy that to your Ouya in a couple more steps. First, make sure your API level is set correctly. Mine already was, so you may not have to do anything. To check it, go to Edit -> Project Settings -> Player and expand "Other Settings." In the Identification section, check the Minimum API Level setting. While you're at it, go ahead and fill in a Company Name and Product Name up top. The Product Name will show up as the name of the game in the Ouya's PLAY menu. In Unity, you should have an "Open Ouya Panel" item in the Window menu. Select it to pull up the Ouya Panel. Click on each of the top buttons: Unity, Java JDK, Android SDK, and Android NDK. If any of the paths are grayed out, you'll need to fix them. When I set this up, my Java JDK paths were all gray; it looks for the default JDK 1.6 path. So if you went the safe route and installed JDK 1.6, you may not have to do any JDK configuration. If you were all aggro like me and went for JDK 1.7, the paths will be grayed out, so you'll have to manually navigate to the SDK. Hit the "Select SDK Path.." button and navigate to your rebellious SDK location. On my machine, it was C:\Program Files (x86)\Java\jdk1.7.0_25\. Important note: There are all kinds of interesting-looking build buttons in the Ouya Panel. I don't have Pro yet, so I got the message "Building Player from editor scripts requires Unity PRO." The "pro" was in all caps, just to put me in my place! Pull up File -> Build Settings and include just the SceneShowUnityInput scene. YES! Yep, that's one ugly screen. Pretty useful for checking out gamepad mappings though. 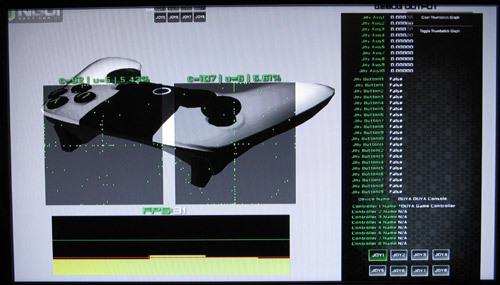 This will show PS3 and Xbox 360, etc controllers too. Oh yeah, and congratulations if you made it this far. You have taken your first step into a larger world. Or something. The icon (if you don't change it) will be the default ouya_icon.png in the /ouya-unity-plugin-master/Assets/Plugins/Android/res/drawable-xhdpi/ folder. To change it, just overwrite that PNG file with your own 732 x 412 image. We'll go ahead and do that in the next tutorial, which will cover deploying your own Unity game from scratch. OK then, next we'll see how to deploy your own Unity game without all of the baggage of the sample project.